Bad Poem or Pop Song? “Okay see, this is a kids show. The hero is named Anpanman. Because, you see, anpan is a type of Japanese pastry. It is a roll of bread filled with red bean paste. And our hero’s head is made of anpan. The red bean paste gives him his power. Thus, his name of Anpanman. Anpanman was baked by Uncle Jam, and a shooting star landed in Uncle Jam’s oven while he was baking anpan. So Anpanman was born and now he fights to protect justice. You see, whenever Anpanman’s head is damaged too much, it must be replaced. He literally loses his head, and a new head baked by Uncle Jam attaches itself to Anpanman’s shoulders. Oh yeah, and also, Anpanman will feed his head to the hungry. Because he’s a good guy. “Now, the villain is Baikinman. He is from Germ Planet and he is the leader of all the viruses. His dastardly plan is to spread bacteria across the world. Only Anpanman stands in his way. Baikinman and his spore henchmen come up with all sorts of schemes to defeat Anpanman, causing him to, as I said before, literally lose his head. But with his new head restored, Anpanman attacks Baikinman with his an-punch and his an-kick. Every time Baikinman is an-punched or an-kicked, he flies backwards and yells, ‘bye-baiking!’ Get it? He is literally yelling bye-bye king as he is thwarted by Anpanman. And at the end of every episode, peace is restored to the land. No, I did not make Anpanman up. Even I am not this clever. What I have just described to you is the most popular children’s show in Japan, and possibly the world. Anpanman. It has been on the air since 1988. It has aired over 1,000 episodes. It holds the Guinness World Record for introducing the most animated characters. The kids over hear freakin’ love it. 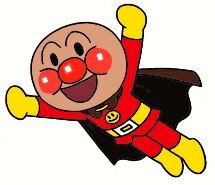 My wife grew up with Anpanman and she can’t get enough of this guy. This guy whose head is made of bread, and is decapitated in every single episode, and once again, I cannot make this clear enough, feeds chunks of his head to hungry people. She loved it. By the end of the afternoon, this little tot would run up to me out of nowhere, attacking my shin with her an-kick. Of course, even if I was deep in conversation about Japan’s foundering economy and how their skewed view on gender roles could contribute to the crisis, I had to throw my hands in the air, cry out “bai-baiking” and fall to the ground. I am sorry Japan. I can’t save your economy just right now. I need to play with a 2-year-old. For those of you interested, here is an episode of Anpanman with English subtitles. It is quite adorable.